Farmer Babel Tena works in a field on the side of Choke Mountain in Ethiopia, March 13, 2019. Choke, Ethiopia — Sloping fields of barley and potatoes stretching far into the distance are a common sight in the mountains of Ethiopia's northwestern Amhara Regional State. Local farmer Babel Tena, in a faded jacket and head scarf, has been cultivating low-yielding varieties of barley, beans and potatoes here for more than 40 years. "Our soil and produce have been washed away by (rain) runoff because we farm on the side of the mountain," said the 58-year-old, ploughing his field with an ox and a horse. Tena and other farmers used to grow beans here, but the climate has now become too dry, he said, frowning. "I have nine children. I have no farmland to hand over," he said, blaming a scarcity of land and a growing population. The climate of the Choke Mountain watershed in the Upper Blue Nile Highlands is changing as the planet warms. Studies by Debre Markos University show the area also faces severe land degradation due to human settlement, overgrazing, deforestation and unsustainable agricultural practices. At an elevation of 4,000 metres (13,120 ft), the Choke Mountain range has a tropical alpine ecosystem and is home to more than 150,000 people living in six districts. They worry the government will close off the areas they now use in an attempt to restore the local environment. "We understand the Choke ecosystem has been degraded and the climate has changed but the question is where (would) we live and farm, and our livestock graze?" Tena asked. Sewalew Fentaw, a 40-year-old sheep herder and father of three, lives an hour by road from Debre Markos city. If the grazing land is enclosed, "my fate will be migration", he said. According to Fentaw, inhabitants of the Choke area aged between 20 and 40 have no other choice but to work as herders due to a scarcity of cultivable land. Most rural families combine livestock and crop farming on small plots. Belachew Miherete, a 52-year-old pastoralist, has five children but no land of his own. He farms with his father, harvesting crops from his family's fields. Two decades back, Choke - which means "very cold" in Amharic - was covered by glaciers. But now all the ice has melted, and it is becoming difficult to find native vegetation such as the giant lobelia tree. "Choke was very cold before but there is an increasing temperature now," Miherete said. 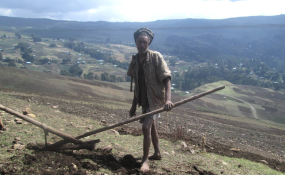 Research by Belay Simane, an associate professor in the College of Development Studies at Addis Ababa University, showed about 90 percent of farmers in the area perceived an increase in temperatures over the past 20 to 30 years, in line with scientifically observed data. In some areas, yields have declined, tipping them from having a food surplus to a food deficit within 20 years. Daniel Desalegn, an official at the Amhara Department of Rural Land Use Management, said crops like wheat and maize were now being cultivated in East Gojjam Zone, and goats kept - both of which would normally thrive in warmer places. "It completely shows there is severe ecological shift on Choke Mountain," he said. Simane said the alpine zone was historically covered in forest and shrubland, but deforestation and land degradation linked to rising populations had enabled cultivation to push as high as 3,800 metres. The Choke Mountains are the water source for the Upper Blue Nile River system which has more than 59 rivers and 273 springs. But severe slope erosion in the watershed - partly due to erratic and intense rainfall, and high livestock numbers - has affected this region and countries downstream on the Nile River. They are spending millions of dollars a year clearing silt from their dams, with some - especially Sudan - suffering flooding. Government officials and academics warned soil being washed away would reduce its fertility in the long run, while siltation could affect the Grand Ethiopian Renaissance Dam downstream. Extreme rainfall and flooding in the Choke watershed have carved out gullies on steep slopes, and caused significant damage to agriculture, infrastructure and property along the Nile. Debre Markos University has partnered with Addis Ababa University to study how livelihoods in the Choke watershed should adjust to cope with - and alleviate - ecological problems. A government biodiversity conservation project, meanwhile, is working to persuade communities to close off areas above 3,600 metres, and to provide incentives for them to maintain the watershed, said its manager Solomon Birhanu. The government is also planning to roll out another approach in the Choke area, known as "payments for ecosystem services". It offers local people financial and other benefits in return for looking after the land better, so its natural functions are preserved. In 2017, Ethiopia's Commission of Environment, Forest and Climate Change began to research charging fees to companies and individuals who directly and indirectly generate income from the country's natural resources. According to Desalegn, the idea - still under discussion - would be to collect taxes from municipalities, timber firms and factories that bottle spring water to pay farmers to protect the Choke ecosystem and the resources they all depend on, including a steady water flow. More ambitiously, the Ethiopian government also wants countries downstream of the Nile, including Sudan and Egypt, to pay taxes for Choke's ecosystem services. "Choke Mountain by itself contributes more than 10 percent of the Nile water, so the ecosystem is not invaluable for just Ethiopia - the downstream countries ... should also share the problems and act accordingly," said Abiyot Molla, who directs research on the Choke watershed at Debre Markos University.